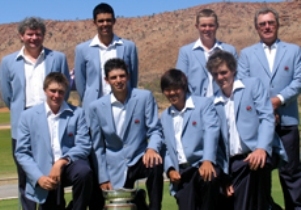 At the 2009 Australian Boys’ Amateur Championship in Alice Springs 9-10 April 2009, the 16 year old Australian Lithuanian Andrius Belkus from Sydney just failed to win first place by only one stroke and shared second place with Anthony Houston from Victoria. The winner was Queenslander Do Eun An. In the last round of the tournament Andrius Belkus got a 6-under par 66 and improved his position from sharing 12th postion to a share of second place. Andrius’ score of 66 set a new junior course record (from the previous record of 67 by Adam Scott). The Interstate Junior series was won by the NSW Junior Team, of which Andrius is also a member. Last week Andrius also won the NSW South West Schools Match Play Final. As well, Andrius and two other players from his school (Westfields Sports High) won NSW Schools Final and will represent NSW Schools in Australian Final in Victoria in August. Also Andrius had a “hole in one”. This is now his fifth “hole in one”, a remarkable achievement!